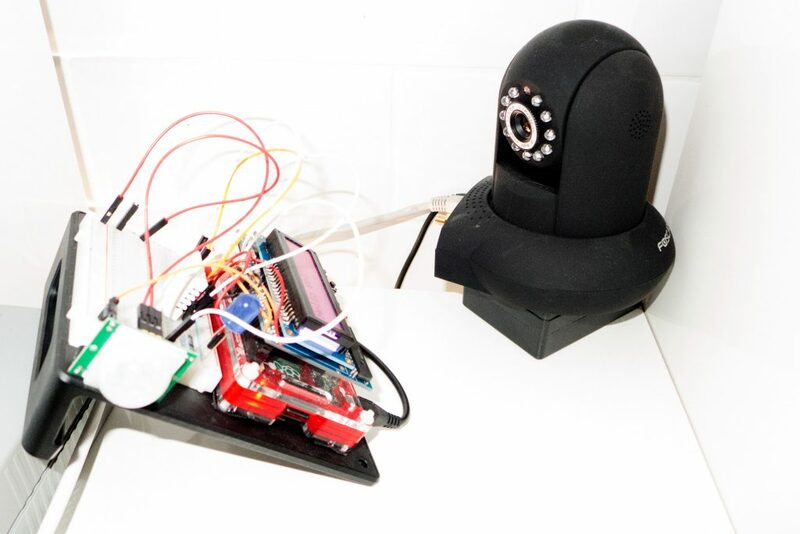 Note: this article was first published in the IoT Technica Curiosa magazine. The Internet of Things – IoT for short – is here to stay and to change our world for the better. This grand vision depicts a world where people, buildings, and physical objects are connected to a single and common network. Bottles of soda, lighting systems, cars and everything in between can provide services and exchange data with each other. You might have noticed that the Internet of Things feels very much like an Intranet of Things: to interact with 10 different devices from your phone, you have to install 10 different apps. The problems is that there’s not a single “lingua franca” spoken by each and every object – there are literally hundreds! The worst part is that most of these IoT protocols and standards aren’t compatible with each other, and for this reason the IoT hasn’t (yet!) delivered on its promises. Connecting every Thing to the Internet and giving them an IP addresses in only the first step towards the Internet of Things. Things could then easily exchange data with each other, but not necessarily understand what that data means. This is what Web protocols like HTTP brought to the Internet: a universal way to describe images, text, and other media elements so that machines could “understand” each. 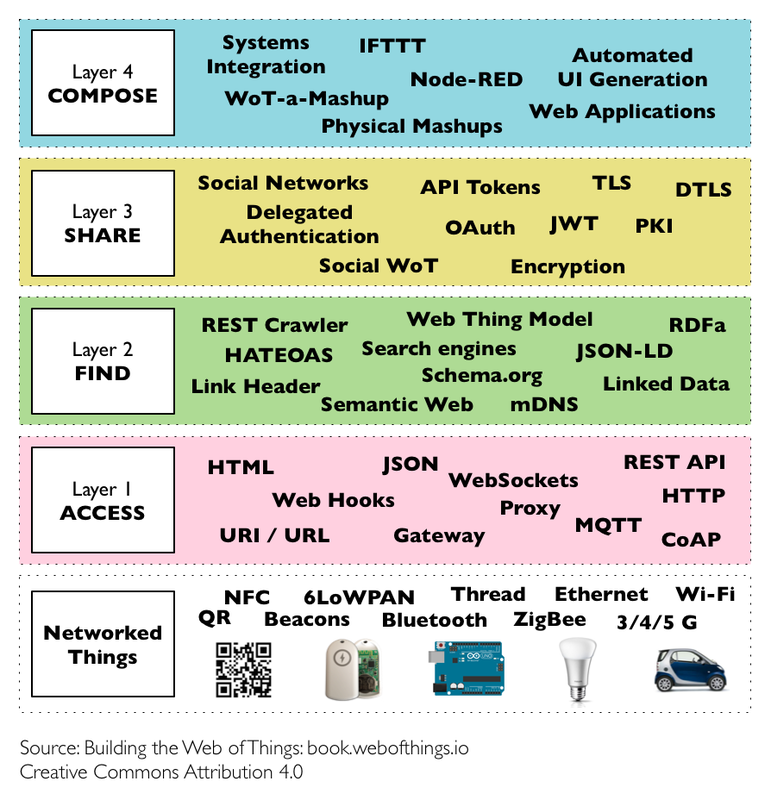 The Web of Things – or WoT – is simply the next stage in this evolution: using and adapting Web protocols to connect anything in the physical world and give it a presence on the World Wide Web! The Web of Things is a refinement of the Internet of Things by integrating smart things not only into the Internet (network), but into the Web Architecture (application). Just like the OSI layered architecture organises the many protocols and standards of the Internet, the WoT architecture is an attempt to structure the galaxy of Web protocols and tools into a useful framework for connecting any device or object to the Web. The WoT architecture stack is not composed of layers in the strict sense, but rather of levels that add extra functionality, as shown in the figure below. Each layer helps to integrate Things to the Web even more intimately and hence making those devices more accessible for applications and humans! This layer is responsible for turning any Thing into a Web Thing that can be interacted with using HTTP requests just like any other resource on the Web. 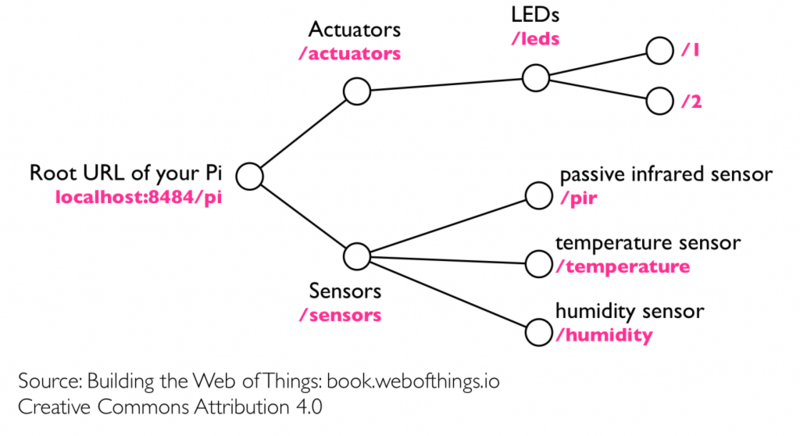 In other words, a Web Thing is a REST API that allows to interact with something in the real world, like opening a door or reading a temperature sensor located across the planet. Go ahead and try this in your browser. You’ll get a human friendly HTML representation with links to the sensors. Click on “temperature” and you’ll get the temperature. What you are doing here is navigating the RESTful API of our Pi, just like you would be browsing a Web page. IoT Things can be mapped to REST resources quite easily as show in the figure below. curl -X GET -H "Accept: application/json" "http://devices.webofthings.io/pi/sensors/humidity/"
You will see the humidity level in our London office in JSON in your terminal. This is the ideal first step to build your first application that expands the Web into the real world! Marking things accessible via an HTTP and WebSocket API is great but it doesn’t mean applications can really “understand” what the Thing is, what data or services it offers, and so on. This is where the second layer – Find – becomes interesting. This layer ensures that your Thing can not only be easily used by other HTTP clients but can also be findable and automatically usable by other WoT applications. The approach here is to reuse web semantic standards to describe things and their services. This enables searching for things through search engines and other web indexes as well as the automatic generation of user interfaces or tools to interact with Things. At this level technologies such as JSON-LD are in use: a language for semantically annotating JSON. This is also where standards such as the Web Things Model and the work of the W3C WoT group help: they define an abstract set of REST resources that Things should offer. The Internet of Things will only blossom if Things have a way to securely share data across services. This is the responsibility of the Share layer, which specifies how the data generated by Things can be shared in an efficient and secure manner over the web. At this level, another batch of Web protocols help. First, TLS, the protocol that makes transactions on the Web secure. Then, techniques such as delegated web authentication mechanisms like OAuth which can be integrated to our Things’ APIs. Finally, we can also use social networks to share Things and their resources to create a Social Web of Things! The Web of Things is a high-level application protocol designed to maximize interoperability in the IoT, and we hope this short introduction gave you a taste of its potential. Web technologies are widely popular and offer all the flexibility and features needed for the majority of future IoT applications, including discovery, security, and real-time messaging. While we only flew over the ideas of the WoT, we hope this sparked your interest in making IoT Things more accessible thanks to the Web. The Web of Things architecture is fully described in our book: “Building the Web of Things”. 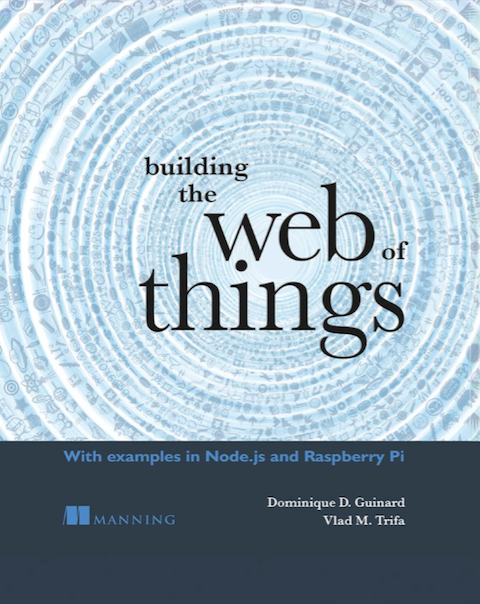 The book is also packed with code examples on the Raspberry Pi using the Node.js language. The code is open source and freely available from: https://github.com/webofthings/wot-book. which simulator can be use for web of things?